The Texel Sheep is a medium-sized sheep. An adult ram weighs approximately 95 kilos and stands at about 70 centimetres at the withers. A mature ewe weighs 75 kilos on average and stands 68 centimetres at the withers. The Texel Sheep is a medium sized sheep, that lambs once a year. Adult ewes usually birth and suckle two lambs per litter. Ewes can have their first litter at 12 months. The Texel Sheep is of very good meat quality, with excellent fat deposition. 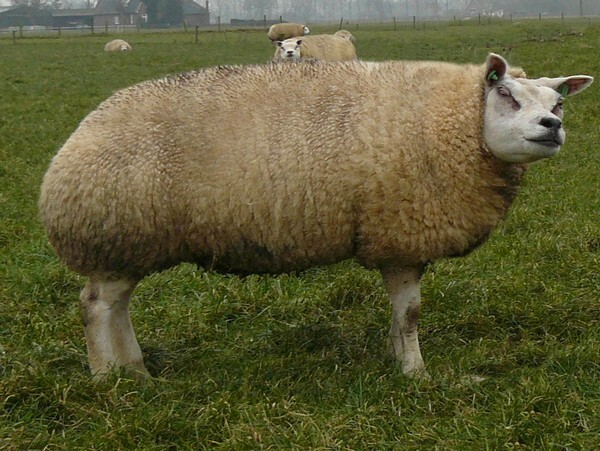 A Texel Sheep is large-framed, has a solid square stance and looks bigger than its actual size. Its head is characteristic and well-proportioned with a straight nasal bridge and a wide mouth. The head is covered with fine white hair, in contrast to the black nose. Its neck is long and in proportion. The body has pronounced muscling with well-developed loins and thighs. The forehand, middle and hind quarters are evenly proportioned. The Texel Sheep’s forehand is broad and deep, with well-positioned and reasonably long shoulders and a breastbone extending sufficiently to the front. Its middle piece is long and broad with sufficient depth in the ribs and broad, strong loins. The hindquarters are broad, while the croup is long and lightly sloped. The legs have a delicate structure, are dry and powerful, and are positioned correctly when walking or standing. Its wool is fine, dense and doesn’t contain excess lanolin. The rump is covered in a white coat. Both head and legs aren’t covered with wool but with fine white hair. The tail is thin and of appropriate length. The Texel Sheep was bred over a hundred years ago as a crossbreed from indigenous marsh sheep and several British breeds, such as Leicester, Wensleydale and Lincoln. This resulted in a large, fast-growing and woolly sheep. Through effective selection, this breed of sheep has become the most heavily muscled meat sheep in the world. The Texel Sheep is a breed in which excellent carcass quality and great prolific qualities come together. The Netherlands has a long history of sheep farming. Approximately 1.5 million sheep are kept on about 20,000 farms. Specialist sheep farms have over 300 ewes. Most sheep are held in dairy farms as a secondary activity, with ewes lambing in spring. Breeding, reproduction and meat farming is mainly integrated in the company’s activities. Sheep are mainly kept for meat production. The profitability of sheep farming is determined by lamb production, growth rate and meat quality. Over the past few decades, sheep farmers have invested a lot of money in research on increasing the profitability of their businesses. By using rams with superior genetic traits, great progress has been made in further improving the functional exterior features and carcass composition. Where in the past the emphasis was on meat and wool production, the main goal of today is the sales of slaughter lambs of a consistent, high quality. * Optimisation of carcass quality. Over the past few years, Dutch Texel Sheep breeding farms have not only been focusing on the improvement of meatiness of the sheep, but also on its growth, fertility and functionality. The development of both a fertility index and a growth index has been a valuable contribution to this. This has resulted in larger, longer sheep that can easily carry and birth 2 lambs. What do breeding values mean and what breeding values are there? Breeding to improve fertility without losing muscularity. Selecting animals with the best genetic abilities to control parasite infections. Choosing rams that pass on reproductive proficiency. All this will soon become much easier when the new breeding values of the NSFO (Dutch Sheep and Goat Breeders Organisation) are released. A breeding value is a prediction for the genetic aptitude for a specific attribute. The breeding value is based on the performance of the animal itself and of all related sheep, if these data are known. Breeding values are often expressed in numbers close to 100, in which 100 is the average for a certain attribute in animals. A number above 100 means that an animal has a better aptitude for this attribute; a value below 100 means a smaller chance of passing on a certain attribute. In the near future, breeding values will no longer be expressed in a number around 100, but in an absolute grade, with positive numbers being more favourable than negative numbers. Currently there are breeding values for fertility, growth, muscle thickness and fat coverage. An index is a combination of multiple breeding values. For example: the slaughter lamb index is based on breeding values for growth, fat coverage and muscle thickness. 2017 will see the addition of various new breeding values: calving ease, birthing ease, birth weight, 8-week weight, 20-week weight (current FW growth), number of lambs born, number of stillborn, precocity, parasite resistance, muscularity, proportionality, head, type, legs and development. The NSFO parentage report will also have a 5-star system for the slaughter lamb index, in which 2.5 stars mean average, 3 stars mean good, 4 stars mean very good and 5 stars mean excellent. Every Texel Sheep breeder can use the breeding values to improve the attributes that he finds important. The progress of different attributes will vary due to heritability. The higher the heritability, the faster the progress.